Having claimed a historic Test series win over Australia, India will now look to continue their impressive run when they face the hosts in the ODIs. And one man who will be closely monitored is MS Dhoni. MSD's struggles with the bat in recent times coupled with the rise of Rishabh Pant could make things complicated as the World Cup nears. 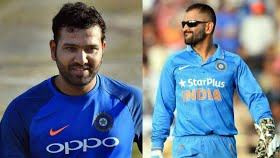 However, India ODI vice-captain Rohit Sharma has backed Dhoni saying he has a major role to play in the team even now. "Over the years we have seen what sort of presence he.has in the dressing room and on the field. With him being around, there is a sense of calmness in the group, which is very important, and also a bit of help to the captain because he stands behind the stumps," Rohit was quoted as saying in media reports ahead of the first ODI against Australia. "He has captained India for so many years and been successful. So him being around with the team always is helpful. He is like a guiding light around the group," Rohit added. Even in the wake of his recent struggles with the bat, Rohit feels Dhoni can still do the job of finisher. "Batting down the order, getting us through the line, his finishing touch is very important and he has finished so many games for us. His calmness and advice, what he thinks about the game and what we should do right now is very important," Rohit explained. India will face Australia in the first of the three-match ODI series on January 12 at the Sydney Cricket Ground.